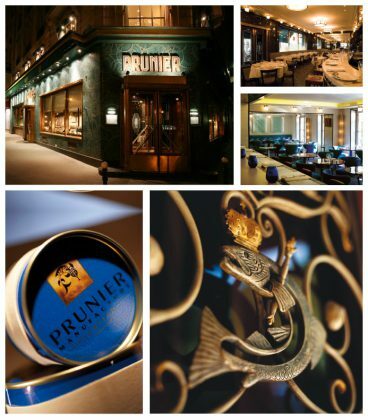 A few steps from the Arc de Triomphe, the Prunier restaurant is one of the must-see addresses for enthusiasts of iodized products of excellence. Opened in 1925, it proposes in a spectacular Art Deco decoration “Everything that comes from the sea” as the motto of the house proclaims. True to the spirit of Emile and Paul Prunier, the founders, chef Eric Cloisel offers delicate cuisine. During the seasons and natural fishing periods, he elaborates delicacies including the famous “Dior egg” which highlights the caviar produced in the Dordogne. A nod to Pierre Berger who bought the famous brand in 2000 as well as the sturgeon breeding and who perpetuates Yves Saint Laurent’s habit of celebrating and sharing love by creating his own greeting cards. Since 2007, Prunier has reissued his creations through a vintage caviar box: Love. More recently, the Café Prunier opened its doors at the Place de la Madeleine in 2006. Both a boutique and a modern and convivial tasting place, the restaurant owes a part of its charm to the decoration by Jacques Grange who brought to the place a soothing and chic atmosphere. For an elegant break in the heart of the tumult of the place.